There are now more choices than ever when it comes to heating, but the majority of homes still use gas, oil or LPG. One way to enable a modern condensing boiler to operate more efficiently is to link it to a warm water underfloor heating system. UFH will work effectively and efficiently with combi, system, conventional gas, oil, LPG and condensing boilers. According to the Energy Saving Trust, boilers account for around 60% of annual energy bills, and by replacing an old gas boiler with an A-rated high-efficiency condensing boiler and improving heating controls, homeowners could save as much as £300 per year and significantly cut their carbon dioxide emissions. The quality of the system design is key to good performance with UFH, so it’s important to establish the most suitable floor construction and flow rates for a property. Nu-Heat, for example, takes elements such as existing insulation and heat loss parameters into account to ensure that not only the desired amount of heat is provided but that the system is also economical and efficient. Boilers need to be sized in line with upgrades in insulation and, to ensure that maximum efficiency is achieved, this should be an integral part of the design element for a new build or complete retrofit UFH system. Logically, UFH has the potential to be the most efficient type of emitter. The surface area of the floor is far greater than that of a radiator, allowing the flow temperature to be lower to achieve the same room temperature. Where a radiator may be heated to between 60˚C and 75˚C, UFH can often achieve the same performance running at just 50˚C, which will allow the boiler to operate in condensing mode. UFH is radiant heat rather than the convective heat associated with radiators, so it gives a very different temperature profile; heat rises from the floor rather than being carried by convection currents and heating the room from the top down, meaning UFH offers the ideal comfort profile of warm feet and cool head. Nu-Heat has successfully integrated its UFH systems into new build (domestic and commercial), renovations and increasingly in retrofit, through the use of low profile floor constructions. It is used in a diverse range of properties, from family homes, barn conversions and apartments to offices, hospitals – even castles and tree houses. As the business of heating houses changes, UFH offers a way to make the most of the efficiency aspect of condensing boilers. 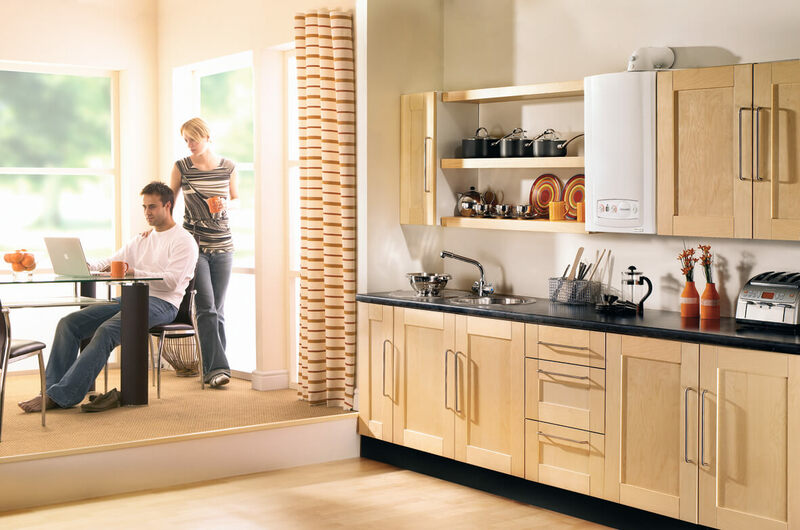 Condensing boilers reduce carbon dioxide emissions and improve household efficiency, resulting in reduced fuel bills. As you know, they work on the principle of recovering as much as possible of the waste heat that is normally ejected into the atmosphere from the flue of a conventional boiler. The combustion process in the boiler combines the fuel with oxygen from the air, but as well as releasing heat there are by-products of carbon dioxide and water. The water is in the form of vapour, which is the steam that can be seen emitting from many older boiler flues. The critical temperature is called the ‘dew point’; this is when the vapour will condense into liquid. Condensation releases a significant amount of latent heat energy from the vapour, leading to the efficiency gain. In order for a boiler to operate in condensing mode the return temperature of the heating system must be lower than the dew point (53°C). Radiators sized traditionally to a design flow temperature of around 70°C with a return temperature of 60°C are outside of a condensing boiler’s range, so cannot make the most of its capabilities; but UFH, requiring a flow temperature of 50°C flow and 40°C return, is ideal to take advantage of this and offer better energy efficiency than a radiator system. The Green Deal is pushing older homes towards such general insulation upgrades as double-glazing, cavity wall insulation, roof insulation and good draught proofing. While renovation is taking place many homeowners will take the opportunity to replace the old boiler for a new condensing model giving installers a perfect opportunity to suggest the option of replacing radiators with UFH. Both parties will benefit; the installer will make the most of the business opportunity and the homeowner will get a more efficient system that saves money on heating bills. UFH is often considered unsuitable for retrofit due to the issue of floor height build up. 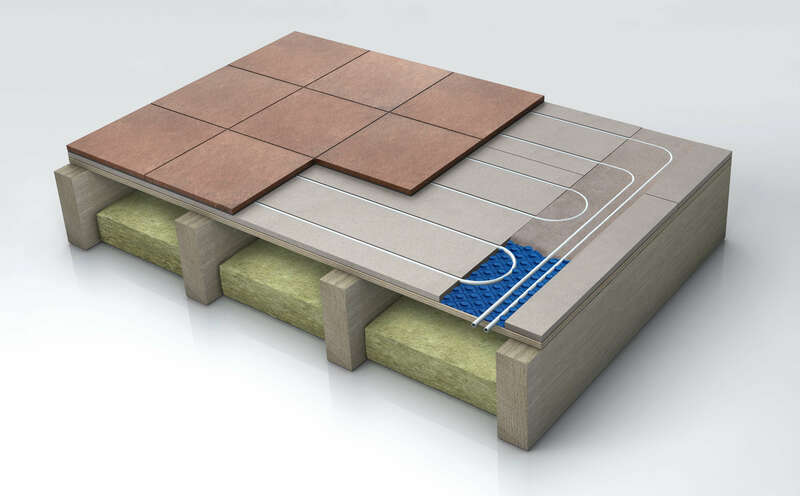 However, products such as Nu-Heat’s LoPro10® floor construction offer a practical retrofit solution. LoPro10® has a height of just 15mm and can be installed without needing to remove an existing deck. UFH traditionally has a slower response time than radiator systems but LoPro10® has one-third less thermal mass than a screed floor so it can heat up and cool down rapidly, making it more economical than a screed construction in retrofit situations. The floor construction’s low thermal resistance and high-density properties provide a high thermal output compared to similar low height plywood and chipboard based systems. There are, of course, certain properties that will not benefit from UFH, such as Victorian or other older, poorly insulated properties with high ceilings that will require more than 110W/m², but it is perfect for refurbishments with insulation upgrades or most properties built within the last 10 years within the higher insulation requirements of Building Regs. It is in these types of property that a system comprising a condensing boiler partnered with Nu-Heat’s LoPro10® is an ideal option. It is clear to see that good suppliers have UFH systems to suit most situations; it is now up to installers to maximise the potential of every job they encounter, not just to increase income but also to improve the carbon performance and reduce the running costs of heating systems in many more UK homes.